The characters also sing: Lin, whose life has been rather hard, is not allowed to train at the Academy to be a poet because she’s a woman (who ran away from one of the most prestigious noble family in the country). Also crisply drawn: Darien and Marlen, the rock star poets who start out as spoiled jerks: one turns into a hero, the other into a villain, and Marlen’s companion Marilla, who is a (former) prostitute who loves Marlen in her own twisted way. Speaking of Marilla, the author, while never getting overly detailed, makes it clear the Marlen and Marilla’s relationship has a distinctly sadomasochistic tone. Many of hers do. In the climax of the book, the characters battle in a mystical battleground, and Marilla must revisit the place she was first forced into a life of prostitution as a young girl. This encounter occurs offscreen. After this, Marilla is finally able to show her love for Marlen without need to maintain an ironic distance to protect herself. Marlen nearly dies too so that seems to help jolt her out of that distance as well. 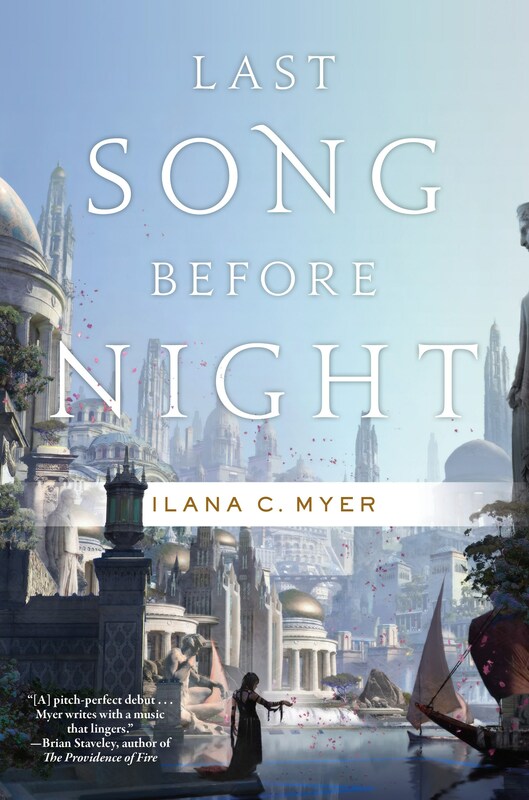 Marilla’s plot flirts with a grimdark tone (as does Rianna’s encounter with Rayen: more on that in a bit) but unlike many authors, Myer leaves the details offscreen—the right choice for me. 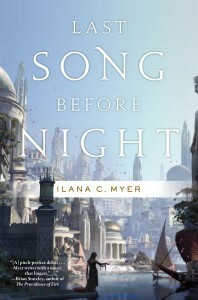 Myer also kills off a main character: I wouldn’t classify that as grimdark per se, but certainly not something fluffy fantasy would do. Another character who shines is Rianna, the somewhat sheltered rich merchant’s daughter who ends up helping to save her father. She transforms in a believable way into a more plucky character. Her fiancee Ned, starts out as a hapless nice guy who knows she doesn’t love him no matter how hard see tries. She initially jilts him for the much more charismatic Darien and Ned has a “dalliance” with Marilla (her word) and goes off on a pirate ship to get killed but doesn’t. When he comes back, Rianna sees him a whole new light. Also (massive spoiler here, so look away if averse) Darien heroically sacrifices himself to save everyone at the end so that certainly helps Ned’s case. And one of the most believable villains in any book I’ve read, Lin’s brother, Rayen, head of a prestigious noble family, who encounters Rianna working in the kitchen of an inn because she’s run out of money and offers to help. He’s a complete gentleman, of course, until he’s not. He manages to seduce Rianna even after admitting that he beat his sister Lin, which he takes as a sick victory of some kind. Another super creepy villain is the Court Poet Lord Gerrard, who, it turns out, is so into necromancy, that’s he’s not even alive. And the world-building! Music fuels magic, but the kings have strictly controlled it for some time. Musicians (poets) enjoy a high social status, although not as much as when they practiced magic openly. The magic starts out fairly low key, but ramps up nicely. Early on, the magic appears to be mostly dream based but then the characters realize that, no, they actually went to the place they “dreamed” about. The author messed with my head—in a good way on this aspect. Previous Previous post: Letsencrypt Part Deux: Failed to connect to host for DVSNI challenge.